US President Barack Obama (R) and British Prime Minister David Cameron pose for a picture with Denmark's Prime Minister Helle Thorning Schmidt (C) next to US First Lady Michelle Obama (R) during the memorial service of South African former president Nelson Mandela at the FNB Stadium (Soccer City) in Johannesburg on December 10, 2013. 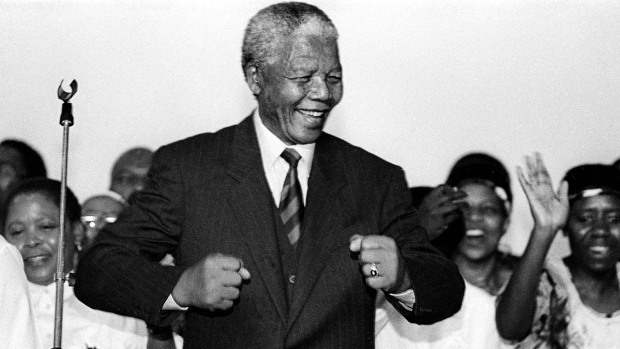 Mandela, the revered icon of the anti-apartheid struggle in South Africa and one of the towering political figures of the 20th century, died in Johannesburg on December 5 at age 95. President Barack Obama on Tuesday snapped a selfie at Nelson Mandela's memorial service in South Africa, proving once and for all that the portraits are not just for self-obsessed millennials. An Agence France-Presse photographer captured the president posing for the photo alongside British Prime Minister David Cameron and Danish Prime Minister Helle Thorning-Schmidt. First Lady Michelle Obama, by contrast, looks straight ahead at the memorial service. The moment caught the attention of news sites across the web, and the three leaders' smiles appears to reflect the jovial mood of Mandela's raucous memorial. The self-portrait has prompted the mastermind behind "Selfies at Funerals" to post one last picture before officially calling it quits. The last post on the viral Tumblr site was originally supposed to have been one posted on Nov. 13. "I'd intended for the post below to be the final one here, but then this just happened at Nelson Mandela's memorial service -- not exactly a funeral, to be fair, but I'll go ahead and take credit for the whole thing," wrote Jason Feifer, the Fast Company editor who created the Tumblr in late October. Selfies were so popular in 2013 that Oxford University Press named it the word of the year in November. While the three world leaders' selfie moment may be going viral, they broke Kim Kardashian's cardinal rule of selfie-taking. "You always need it to be a little bit higher," Kardashian said, referring to the position of the phone, in a YouTube video on selfie-taking in November. Obama appears to have the smartphone positioned below the eye level. The move helps picture-takers capture their best angles, said Kardashian, who herself appeared in a viral selfie in October that showed off her post-baby body. Other famous selfies this year include one that First Lady Michelle Obama took with first dog Bo. Former Secretary of State Hillary Clinton snapped one with daughter Chelsea in June. Obama's selfie was not the first to be taken at a serious event. In October, a Florida teenager found Internet fame after he took a self-portrait while his teacher appeared in the background swooning from labor pains. Just last week the New York Post shamed a woman on the tabloid's cover for taking a selfie as crowds watched a suicidal man on the Brooklyn Bridge.